Farmers have begun taking their animals back to market in areas of the country at low risk of foot-and-mouth, after government vets eased movement restrictions. The Skipton countryside is stunning. Craggy green hills, cloaked in hazy mist on an otherwise clear, golden, autumn day in Yorkshire. The sheep in the fields, to an outsider, look like attractive additions but to the farmers, they are the visible signs of impending ruin. It's believed the word Skipton is derived from the Anglo-Saxon word for sheep - which gives a good idea of how important the animals have been for the town's prosperity. They once brought wealth and prestige. But now, most farmers find it hard to make a living from livestock. With the restrictions imposed as a result of foot-and-mouth, they say that has now become nigh on impossible. 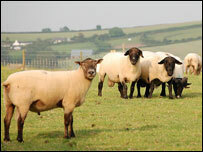 The outbreak could not have come at a worse time for British livestock farmers. The next couple of weeks are traditionally some of the busiest of the year, with hill farmers making the bulk of their annual profit at the autumn sales. They sell on "store lambs" to other buyers who will keep them - as well as breeding ewes - until they themselves sell them on in February or March. Government vets are doing what they can to make sure that the restrictions do not destroy the very thing they are trying to save. Britain is now divided into "risk" and "low risk" areas, in terms of foot-and-mouth, as well as a protection zone around previously-infected farms in Surrey. The foot-and-mouth low risk area includes all of England, Scotland and Wales, apart from south-east England and the Home Counties. Although quiet, the first day of the sales in Skipton did have a buzz about them if only because they're the first such sales in several weeks. Farmers, their faces lined from years of hard work outdoors, leant along the rails of the livestock ring, flat caps in hand or on head, making bids in a way so imperceptible they were only obvious to the auctioneer, whose sing-song tally of the price was only understood by those who needed to know. "Prices are depressed but not as depressed as we feared," said sheep and arable farmer Russell Toothill, the National Farmers' Union chairman for South and West Yorkshire. "The selling season's been compressed into a few weeks. Farmers are running out of feed and running out of money." For many people, it's good to get out and have a coffee and a pie in the livestock market cafe with other farmers. The hills can be lonely places. One farmers told me of someone who came with their animals to market three days after the foot-and-mouth outbreak and the immediate imposition of a total livestock movement ban. The export ban has meant a glut of lamb in the UK, which has further depressed prices. Everybody agrees that getting the export market started again is vital and, in theory, this could happen in a few days time as European vets have agreed to this in principle. But the word on the street is that slaughterhouses say there's so much red tape involved in these new regulations, in terms of inspections and cleaning, that it's not worth their while to slaughter export animals. "I really hope they will," Environment Secretary Hilary Benn told the BBC. "I know it's difficult, I know there are rules, but we've got to make it happen."